For this show, our guest was friend and super blogger Jeff Bullas. We first met Jeff Bullas to interview him at his office in 2011 to find out how he had attracted 47,000 twitter followers. Since then, he’s up closer to 250,000 followers and has joined us as a speaker at our Social Media Down Under event. started with own domain name was really important. Owned assets are crucial – self hosted and own domain name. 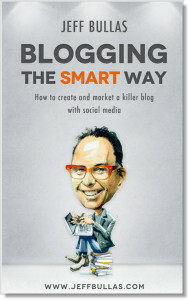 Advice came from Darren Rowse and other top bloggers in the industry. Creates the best content he can on his platform, social media is how he gets it out – Hub and Spoke model. Not building email list from day 1 – gives you owned channel to share your content. Content is what you own, you can accelerate by paying for advertising online. Creating and feedback online is a powerful synergy. Could be curating – not always creating. List posts. Put content in a format that is easy to consume and adds value to readers’ lives – possibly just by saving them time and putting it all in one location. Can position you as a thought leader in your industry. If you want to write a lot, you need to read a lot. Feedly has taken up the mantle of pushing content to you. Get up early – 4:30am – Jeff’s time to create. Create your space and time. Seize a moment – stop the car and write down an idea and interrupt a conversation. Inspiration sometimes moves on. Need to capture it. 1 blog post every day 5 days a week. Uses a plug-in called Yoast for SEO. Article by article – possibly create summaries on weekends. Repurposing blog posts to more visual formats like Slideshare. There is no commitment – you are one click away from oblivion if you are boring them. Stephen King – when people read something, it needs to look fluffy but not be fluffy. Stephen King – On writing – 100 pages of his writing journey and 200 pages of his writing toolkit. Make the journey enjoyable and make a difference to people’s lives at the same time.